Placemaking is an effort to reimagine public spaces as areas that help strengthen a community's relationship to its surroundings. It involves a civic approach to planning, design and management by capitalizing on a local community's assets and potential. Structured parking facilities bring patrons to park for a variety of uses, including residential, office, retail and entertainment. As such, parking facilities serve as a gateway to a community, making them ideal locations for implementing a placemaking strategy. Garages are hubs for additional services, information and promotional programs for nearby businesses. They also contribute to economic and community development, providing employment opportunities and tax revenue. From Oregon to Florida, check out these standout examples where placemaking evolved through parking structures. The 850-space, mixed-use facility, adjacent to the Federal Courthouse in downtown Miami, provides ample open space. The garage utilizes a land bank to provide a passive reflection park, which serves as an attractive community-gathering place for the neighborhood’s employees, residents and visitors. (sub)Urban Projections was the first digital art and media projection festival in Eugene. The event partnered with downtown businesses to present a free public display at the top of the Hult Center Parking Garage. 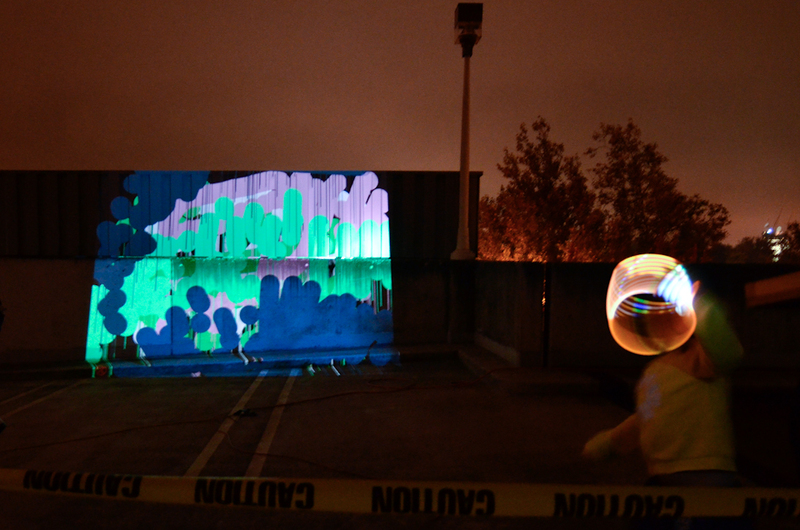 Digital video and art installations by local, national and international artists were projected onto alley walls and parking garage surfaces in downtown Eugene. Photo by Jeff Matarrese at the Daily Emerald. Once the site of a three-story municipal parking garage, Post Office Square is now home to a 1.7-acre street-level park and a seven-level underground parking garage. It's located in the center of Boston’s financial district. The park’s features include a fountain, a park pavilion, benches and sitting walls. One gazebo-like structure shelters a café, while another covers the escalator entranceway to the garage. Post Office Square Park is intended to be a passive park, yet it has a 24-seat café that leases its space from the park and expands outdoors in good weather. The café also operates additional food carts. Twice a week, local musicians play in the park, and during the winter holidays, a brass quintet performs. Underground, the garage houses car-care services, shoe-shine services, a dry cleaner, telephones, clean restrooms, free phone connection to a 24-hour traffic hotline and ATM machines. Local readers nominated their favorite books to adorn the side of this parking garage turned Kansas City landmark. More of an oddity than an architectural innovation, each of the 22 spines of classic literature measures 25 feet by 9 feet and is sandwiched between two metal stairwells that act as the bookends. Photo by Mike Sinclair, courtesy of the Kansas City Public Library.